The presence of international missions in weak and failing states across the globe confirms that multi-lateral involvement has become a strategic imperative to secure international peace and security. With demands for democratic governance and peaceful coexistence in countries such as Afghanistan and Iraq, the questions and issues addressed in Bosnia take on greater urgency. Focussing on Bosnia after the Dayton Peace Agreement (DPA) in 1995, this book examines the role of the international community in state building and intervention. It makes two arguments that challenge conventional, power-sharing approaches to conflict management based on group representation and elite collusion. First, the author explores the idea that effective intervention requires moving beyond the dichotomy between international imposition of state-building measures and local self-government. When compromise among the former warring parties proves impossible and domestic institutions cannot autonomously guarantee efficient policy-making, the presence of international staff in domestic institutions can guarantee further democratisation and local ownership of the peace process. Second, this book argues that the long-term transformation of conflict requires the active involvement and empowerment of domestic civil society groups. Instead of considering domestic society as a desolate blank slate, international intervention needs to build on local resources and assets, which are available even in the aftermath of a devastating war. 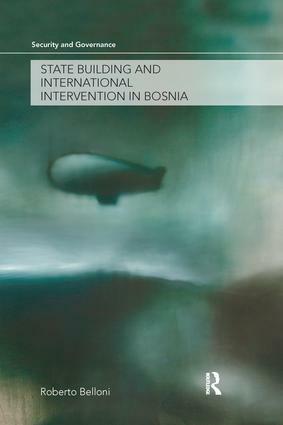 Based on extensive field research this book will be of interest to students, scholars and policy makers struggling to understand and improve upon the dynamics of international intervention, and to those with a specific interest in the Balkans.